Around 50 aspiring physicians spent the first part of December with what at first glance might appear to be a getaway to a spa: getting a massage, being treated with acupuncture needles, perusing a marijuana dispensary. 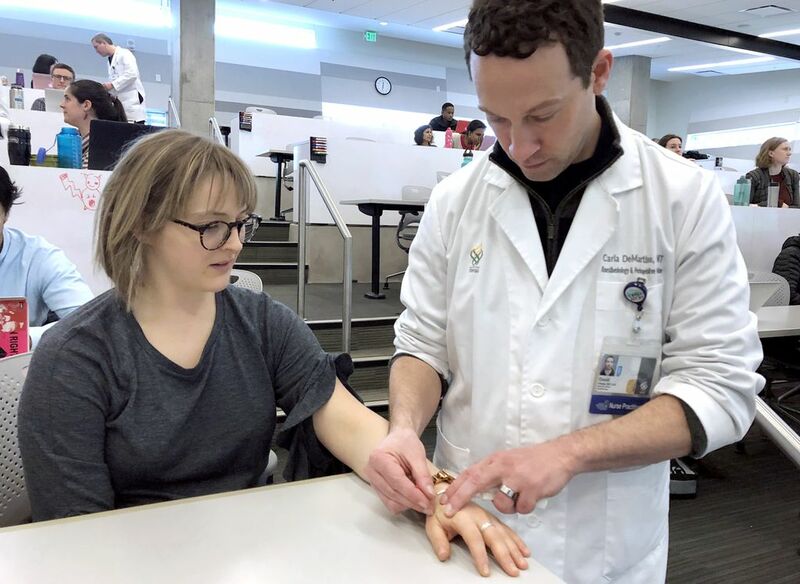 In fact, the OHSU School of Medicine students were taking part in a comprehensive program of pain education that stands out among medical schools nationwide. The goal is to ensure the next generation of health care providers understand there are multiple approaches to help patients manage pain apart from opioids, says Philippe Thuillier, Ph.D., who organizes and directs the pain management coursework at OHSU. Three times a year, the OHSU School of Medicine organizes the two-week “intersession,” bringing together OHSU specialists, national experts and patients who understand pain. The School of Medicine began requiring the focused intersession in 2016 as a fundamental aspect of students’ education: Diving deep into pain so that they will be able to help their patients understand and manage their pain. 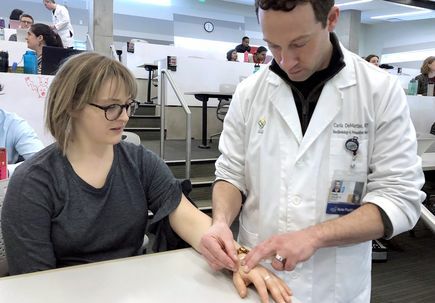 Plenty of medical schools offer elective coursework in pain management, but OHSU requires the two-week pain intersession of all its medical students – whether they aspire to be a surgeon, obstetrician or primary care physician. In light of the nation’s opioid epidemic, it may be surprising that pain management has traditionally been a secondary point of emphasis in America’s medical schools. However, experts say it’s the exception rather than the rule to find pain management integrated into the curriculum, as it is at OHSU. One set of curriculum recommendations cited a study that found the average American medical student received less than 10 hours of education specifically about pain, compared with 80 hours of training for people studying to be veterinarians in Canada. That changed dramatically beginning in the 1990s with a heightened focus on pain management. In the mid-1990, the American Pain Society began to advance the concept of pain as the “fifth vital sign,” in addition to pulse rate, temperature, respiration rate and blood pressure. At the same time, pharmaceutical companies began heavily marketing opioids beyond their traditional use in cancer treatment and end-of-life care. Widespread use of prescription opioids led to misuse, addiction and overdoses. In 2017 alone, more than 72,000 people died from drug overdoses in the United States – more than the number of U.S. soldiers killed during the entire Vietnam War. Hogans said OHSU stands out for the quality of its medical education around pain. Although data about pain education across the nation is imprecise, Hogans estimates OHSU is in the top 10 percent among medical schools nationwide. “They’re doing some really innovative stuff,” she said. The school’s focus on pain reflects the reality that future physicians will experience in their clinics, said Catriona Buist, Psy.D., assistant professor of anesthesiology and perioperative medicine in the OHSU School of Medicine. Buist, a past chair of the Oregon Pain Management Commission, estimates that 80 percent of visits to primary care clinics relate to some aspect of pain. The school integrates pain management for all four years of medical education, but the pain intersession takes it a step further. It includes 65 hours of class time (compared with 10 hours or less at most medical schools), followed by case studies requiring students to address aspects of pain management concerning clinical practice, basic science and the overall health system.